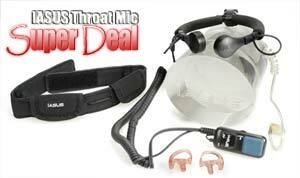 For the holidays, we are offering a a super deal on IASUS throat mics. FREE SHIPPING on all IASUS NT Sniper throat mics with FREE Throat Strap ($17 value) & a pair of silicone Contoured Ear Pieces ($17.50 value). IASUS Throat Mics are the best in the industry with dual vibration sensing modules to convert your throat vibrations into crystal clear voice communications. By picking up throat vibrations instead of ambient noise through a traditional microphone, IASUS throat mics can filter out all background noise and only transmit your voice. This is perfect for clear communications in noisy environments. IASUS Throat mics are so good looking that they were used in the TV Series "24" and also in the Hollywood Movie "Battlestar Galactica". IASUS NT Sniper Throat Mic is available for a wide range of radios including Motorola, Garmin, Cobra, Uniden, Kenwood, ICOM, YAESU and more! This offer valid for the full line of IASUS NT Sniper! BUY IASUS NT SNIPER THROAT MIC..